Tim Tebow has sure made the sports headlines as of late. The popular quarterback of the Denver Broncos, known for being unapologetic about his Christian faith (something I applaud, of course), has perplexed not a few sports commentators by his seemingly miraculous comeback-victories after struggling through three-and-a-half quarters of a game. Given the last few “miraculous” wins of the Denver Broncos and quarterback Tim Tebow, do you think a case can be made that God is intervening — that He’s somehow helping Tebow win due to Tebow’s avowed faith in Christ? Also, do you believe that God wants certain sports teams to win at certain times? ‘It’s clear that God sometimes intervenes for a particular side, as he did with the Israelites against the Egyptians and then the Amalekites, but it’s also clear that when God intervenes on a particular side, that side doesn’t always ‘win’ according to human categories, something we see particularly poignantly on Good Friday. So it’s certainly possible that God could intervene in a football game and could intervene for Tim Tebow, but even if he did so, it might not mean that he’s intervening to have Tebow triumph. 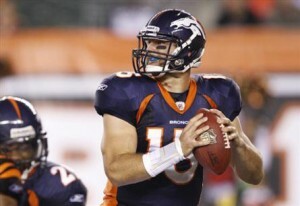 He might intervene precisely to have Tebow’s humility and real character show off in defeat. ‘The problem for us is, short of God himself telling us what he is doing and why, the fact and the form of his interaction cannot be known with any certainty. The psalms teach us that often the impious prosper and the good suffer, so the very fact that Tebow is winning, and winning repeatedly, and winning repeatedly in what seems a ‘miraculous’ way, does not tell us that God himself is acting in his favor. Likewise the fact that Marion Barber inexplicably went out of bounds in regulation and then fumbled the ball in overtime isn’t a sign of divine malediction or maleficence. All of this is shrouded in mystery and we need to be humble to admit that we don’t know exactly what God is doing — and those who claim they do are not theologically or spiritually reliable. ‘My own hunch, for whatever its worth, is that while God in eternity sees the outcome at the same time he sees the kickoff (and at the same time he created the world! ), he’s not controlling the outcome, but in creating us free allows for the contingencies of that freedom in his creation. In other words, although he sees the outcome, he doesn’t rig it as a master puppeteer, but rather under ordinary circumstances allows his beloved children on both sides to play it out. ‘In an indirect way, however, I think that Tim Tebow’s faith does have an impact — even a major impact — in his success on the football field. Knowing the history of salvation, he knows that nothing is impossible and so never gives up hope even in the most desperate circumstances. It makes him in a sense fearless because he’s not afraid to lose the game since he well recognizes life is more than the game of football. His faith inspires him to give all he has in practice, in the weight room, in study, because he seeks to sanctify his work on the football field and give God the best he can.